Good Monday morning and welcome back. Hopefully, your computer doesn't make you WannaCry this morning as the global cyber attack has apparently infected more than 200,000 computers so far. Oil, North Korea, and European politics are also in focus this morning. A barrel of West Texas Intermediate crude was trading up more than a dollar in early trade Monday as the Saudi's and Russia publicly announced they favor extending production cuts into the first quarter of 2018. In the latest round of provocations, North Korea launched a new ballistic missile that can purportedly carry a nuclear warhead. And in Europe, Emmanuel Macron was sworn in as France's next President and Angela Merkel's party received a boost over the weekend, creating hope for stability in the region. On the markets front, stability seems to be the key word to start the day as there are no new political surprises out of Washington. 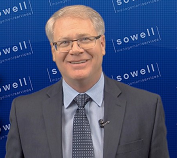 While the overall trend of the stock market is up, the short-term Trend Model has sagged a bit due to the sideways action seen over the last three weeks. The short-term Channel Breakout System remains on a sell signal at this time. A close above 2404 would trigger a new buy signal. The intermediate-term trend of the market remains positive. The intermediate-term Channel Breakout System is mirroring the short-term at this time. The Cycle Composite points lower this week but is close to turning positive for what could turn out to be a summer rally. 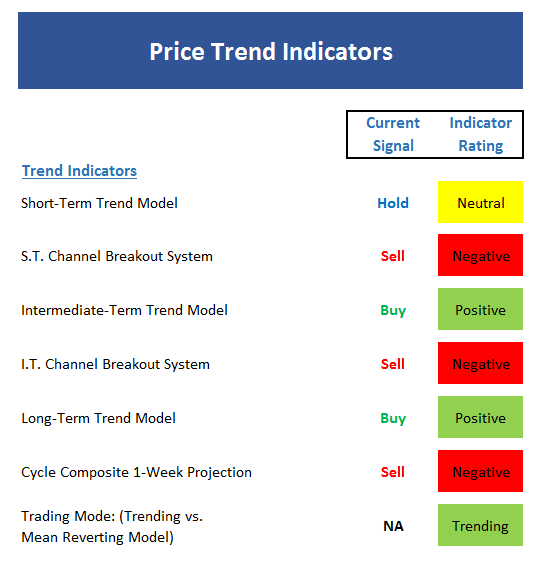 The Trading Mode models now agree that the market is in a "trending" mode. The short-term Trend and Breadth Confirm Model is being whipped back and forth by the extremely tight trading range - and is currently negative. Our intermediate-term Trend and Breadth Confirm Model remains positive. The Industry Health Model remains stuck in neutral - a sign that market leadership is narrow. The short-term Volume Relationship has turned negative again. This in spite of the market indices being near all-time highs. This is something to watch. The intermediate-term Volume Relationship model itself remains positive. But the up volume smoothing is in a clear downtrend and down volume is trending higher. The Price Thrust Indicator is still in the green zone - but not by much. The Volume Thrust Indicator is going nowhere fast. The Breadth Thrust Indicator is also neutral. The combination of the Thrust Indicators tells me that the bulls have no real momentum at this time. From a near-term perspective, the market has worked off the overbought condition and is now neutral. From an intermediate-term view, stocks remain neutral. Thus, neither team has a clear advantage here. The Mean Reversion Model remains on a Sell Signal. The VIX Indicator gave a sell signal more than 10 days ago, as such the signal will soon "drop off"
From a short-term perspective, market sentiment remains neutral. 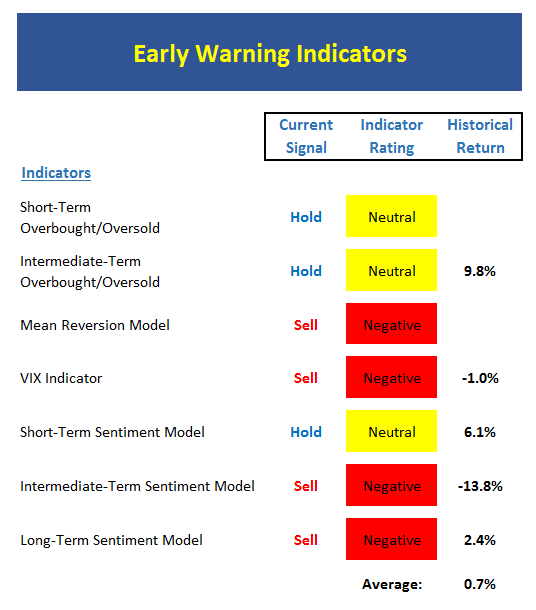 No change, the intermediate-term Sentiment Model is still negative. Longer-term Sentiment readings are also still negative. The song remains the same as the absolute Monetary model is in the lower reaches of neutral. On a relative basis, our Monetary Models continue to move up in the neutral zone. Our Economic Model (designed to call the stock market) is improving, but is still (a) negative and (b) out of sync. The Inflation Model continues to move lower and in the neutral zone. 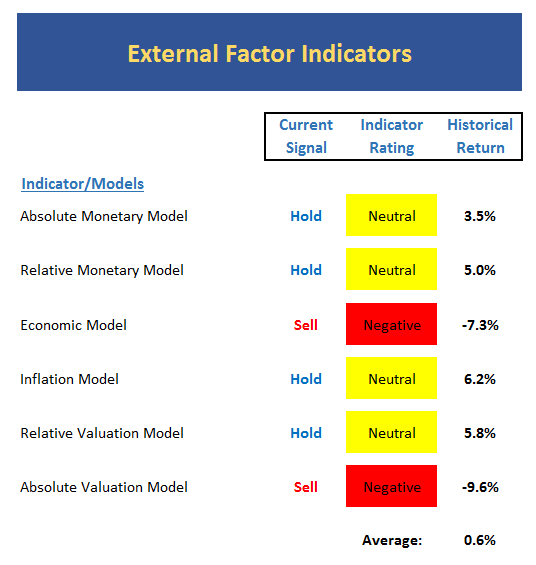 Our Relative Valuation Model is near the lowest readings since 2009 but remains in the neutral zone. The Absolute Valuation Model is still a screaming sell. 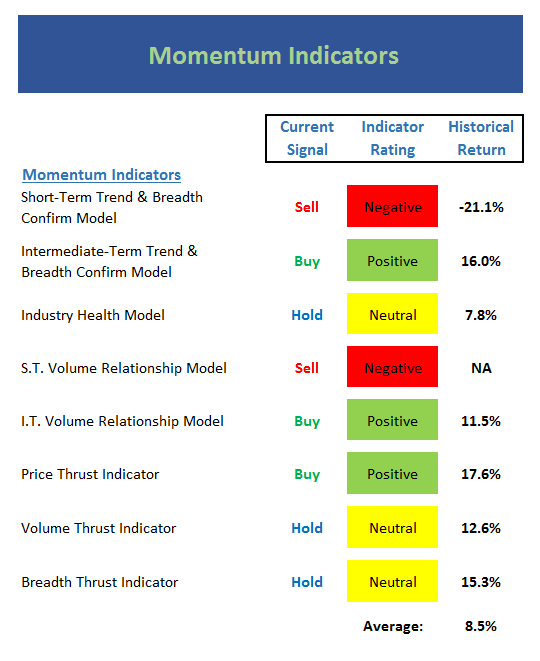 The Leading Indicators model, which did a fine job signaling the start and end of the last bear phase, issued a sell signal last month and remains in the neutral zone. However, it is worth noting that the reading of the model is improving. 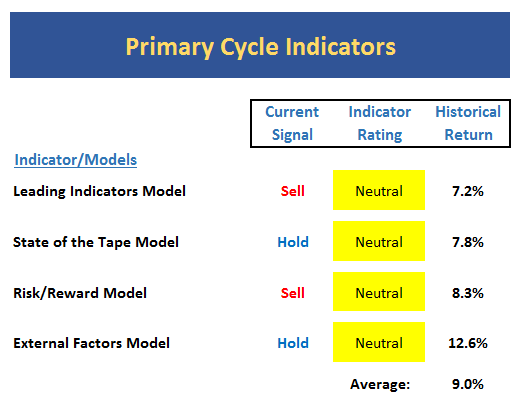 The Risk/Reward model remains on a sell signal but has moved back up to high neutral reading. There is no change to the External Factors model this week as the reading remains a smidge into the neutral zone. Although the S&P continues to flirt with new highs and the trend of the NASDAQ is clearly up, my favorite, longer-term, big-picture models are not in their happy places at the present time. As such, I'm going to call this a potential key divergence. And while this type of condition can stay in place for a long period of time, it is worth noting that such conditions are also associated with aging bull markets. So, as I've been saying for some time now, I see risk factors as elevated.